In one of the worst kept secrets in economic history, the Federal Reserve is expected to officially increasing its benchmark interest rate to 0.25% on Wednesday. It’s the first increase since 2006 and it ends the last remaining hangover of the financial crisis. But now the fun begins. Rates have sat at historic levels–zero–for seven years to the day. After such a long stretch of cheap money, there appears to be more nervousness than usual about what will happen. The stock market has gyrated over the past month. Some of that has been because of the price of oil, and worries that corporations, particularly energy companies, may not be able to pay back their debts. But at least some of the worry is about interest rates. That’s because Wednesday’s decision is unusual. Typically, the seven board members agree to move up interest rates to fight off inflation. But this time around there hasn’t been much inflation. And the economy is growing at a weaker pace than when the Fed has hiked rates before. Nonetheless, Chairwoman Janet Yellen’s announcement appears to come out of a desire to give the Fed a way to counter a downturn in the economy in the future. Keeping the rate at zero gives it little recourse if the Fed needs to help stimulate markets. It’s also strange for the U.S. central bank to raise interest rates, while central banks in Europe and Japan’s continue to lower as their respective interest rates in order to try to get over the last hump of their own downturns. That’s likely to add to the volatility of the market after a rate hike occurs. For stocks, the first interest rate increase is likely mostly priced into the stock market. What happens next is a bigger unknown. Looking at money markets, Martin Hochstein of Allianz Global Investors estimates that investors believe that the Fed will eventually raise the interest rate to 1.2% by 2017. But according to the Fed’s economic projections, rates are likely to reach 2.6% by 2017. Historically speaking, though, Hochstein found that analysts underestimated the last three rate hike cycles. So that 1.4 percentage point difference is a “huge gap that could start some troubles,” added Hochstein. If the Fed ends up raising rates higher and quicker than investors expect that will likely be bad for the stock market. Goldman Sachs says that valuations of the stock market tend to drop 10% in the first year of tightening cycles. In the past, shares of energy, industrials, and technology often outperform other areas of the economy during a rising rate cycle. But given dropping oil prices and lower demand from emerging markets, things may play out differently this time, at least for energy and industrials. Banks often get pointed at as potential buys when interest rates rise. And shares of the biggest banks have been rising lately. That’s because they can benefit from higher interest rates as long as they don’t have to pass that higher interest off to borrowers. But TIAA-CREF’s data shows that financials only outperformed the market 14% of the time, dropping an average of 4%. Utilities tend to underperform when rates rise. The sector has returned -5.8% on average, if you exclude 2004’s blip. But 2004 shows there can be surprises. In that tighten cycle, utilities were up 28%. For bonds, when interest rates rise, prices fall. And this time could be worse than usual. That’s because interest rates are so low, they won’t compensate for price drops. Using today’s yield, Hochstein ran simulations using past interest rate rises, finding that short term Treasuries could fall as much as 1.3% while long-term ones could drop 10.4%, if rate hikes proceed as the market thinks. The current yield on the 10-year Treasury bond is 2.3%. Meaning it could take you five years to earn back in interest what you lose in price over a year. So while bonds are typically a safer place for your investments, these days that likely not the case, especially considering the growing worries about corporate credit quality. The benefit could be anyone who has money in a bank account. According to data from the Federal Reserve, Americans households and non-profits (the Fed combines the two categories) have just over $8.3 trillion in bank savings accounts. So a 0.25% increase could mean an extra $21 billion in interest, or about $163 per American household, a year. But, again, it’s not clear that banks will actually pass that extra interest along to savers. As for borrowing, there is already a large gap between interest rates and what most people pay on their credit cards. Greg McBride of Bankrate.com says it usually takes more than one interest rate hike to impact credit card rates. Variable rate home loans usually adjust once a year. If the Fed raises rates two or three times before your next loan adjustment, then “you could see a noticeable interest rate increase” on your house payments, adds McBride. But most borrowing rates, like 30-year mortgages, are tied to longer term interest rates, which typical rise when the economy is expected to do better. So if the Fed ends up raising interest rates without sending us into a recession, then borrowing costs for houses and autos could go up too, and that will cost consumers. But hopefully the extra cost will be a small price to pay for a better economy. Even though most people are rarely part of a real estate transaction, everyone believes they are an expert. While there’s a prevailing belief that buying without a real estate agent will save you money, the truth is you’re almost always better off working with a pro. Buying or selling a house is not something most of us do every day. You may do it once a decade, or even once in a lifetime. Despite the fact that most of us enter the world of real estate only rarely, we all think we know how it works, based on the experiences of friends and family members, stories we have heard and things we have read. In recent years, technology has radically changed the way homes are bought and sold, and yet some aspects of real estate are the same as they were when your parents bought their last home. If a long time has passed since your last transaction, you may be surprised at how much has changed. The Internet has made much more information available to consumers, but not all the information is equal, or even accurate. Set your home price higher than what you expect to get. Listing your home at too high a price may actually net you a lower price. That’s because shoppers and their real estate agents often don’t even look at homes that are priced above market value. It’s true you can always lower the price if the house doesn’t garner any offers in the first few weeks. But that comes with its own set of problems. “Buyers are highly suspicious of houses that have sat on the market for more than three weeks,” says Nela Richardson, chief economist for the brokerage Redfin. In areas such as San Francisco where multiple offers are common, sellers will actually price their homes for less than they expect to get, in the hopes of getting multiple offers above asking price. However, if you do this in a declining market, the danger is that all the offers will come in at the asking price or lower. You can get a better deal as a buyer if you don’t use a real estate agent. “That’s a completely false premise,” Elika says. If the house is listed with a real estate agent, the total sales commission is built into the price. If the buyers don’t have an agent, the seller’s agent will receive the entire commission. You can save money selling your home yourself. Some people do successfully sell homes on their own, but they need the skills to get the home listed online, market the home to prospective buyers, negotiate the contract and then deal with any issues that arise during the inspection or loan application phases. It’s not impossible to sell a home on your own, but you’ll find that buyers expect a substantial discount when you do, so what you save on a real estate commission may end up meaning a lower price. It’s not impossible to sell your home on your own for the same price you’d get with an agent, but it’s not easy. The market will only go up. In recent years, homebuyers and sellers have experienced a time of increasing home values, then a sharp decline during the economic downturn and now another period of increasing values. “They think that the market only goes up,” Elika says. “They don’t think about when a correction will come.” The recent recession should have reminded everyone that real estate prices can indeed fall, and fall a lot. Economist Robert Shiller created an inflation-adjusted index for home prices dating to 1890 and found that home prices have fallen a number of times over the years, including in the early 1990s, the early 1980s and the mid-1970s. All the properties listed in the multiple listing service show up online. Your agent must choose to let the listings show up online. Most do, but it never hurts to verify that yours will. The agent who shows you homes or lists your home represents your interests. Maybe and maybe not. In about half the states in the U.S., agents may be “transaction brokers” who don’t have a fiduciary duty to either the buyer or seller. In many states, a customer has the option of signing an agreement for the agent to represent him as a listing agent or as a buyer’s agent. Before you start working with the agent, ask about your options and do some of your own research. Most brokerages require buyers and sellers to sign a form indicating that they understand whom the agent represents. 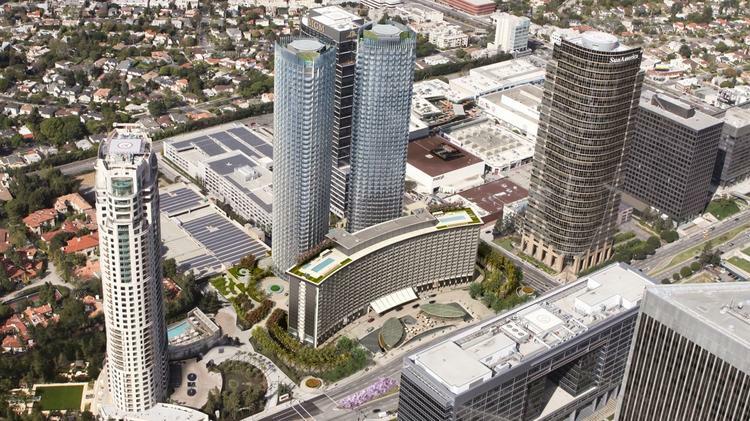 The historic Century Plaza Hotel in the heart of Century City will close on March 1 to begin a $2.5 billion restoration project. Michael Rosenfeld, chief executive of Los Angeles-based Woodridge Capital Partners who is leading the project said the hotel is expected to re-open in early 2018. Situated at the intersection of Avenue of the Stars and Constellation Boulevard, the 1.5 million square foot hotel and mixed use development is adjacent to the Westfield Century City Mall and more than 10 million square feet of offices, residences, restaurants, retail and entertainment venues. The development will feature two 46-story luxury residential towers, restaurants, retail shops and a newly designed 400 room 5-star hotel. The hotel with its iconic crescent shape, designed by Minoru Yamasaki, will be restored with 394 guest rooms and suites and 63 residences. The open air lobby will be transformed by design firm Yabu Pushelberg connecting public plazas and fountains to a central two-acre garden surrounded by restaurants and retail. In total, there will be 100,000 square feet of retail on the site. The two 46-story towers designed by Pei Cobb Freed will feature 290 luxury residences completing the project. Rosenfeld also announced the successful completion of $450 million in funding for the project. “Mayor Eric Garcetti and his staff were instrumental in paving the way with their strong international outreach,” said Rosenfeld, adding that the project is expected to generate thousands of construction and permanent jobs and substantially increase tax and sales revenues to the city. Hyatt will no longer manage the hotel after it closes in March, but an agreement with Unite Here Local 11 provides its members with an opportunity to return to the hotel upon its reopening, Rosenfeld said. A rise in short-term interest rates by the Federal Reserve in two weeks wouldn’t snuff out the housing recovery, Fidelity Investments fixed-income portfolio manager Bill Irving said Thursday. “[Nobody] expects 10-year and longer rates to move as much as the fed funds rate might move,” said Irving, whose funds manage $35.6 billion in assets. “I don’t think that the start of this hike cycle means that for instance that mortgage rates are going to rise a lot,” Irving said. “I think the housing market will take this quite in stride.” He sees the real estate market supported by a continued gradual loosening of lending standards and gains in employment and income. Irving thinks Fed Chair Janet Yellen and her colleagues will indeed raise the fed funds overnight lending rate by 25 basis points at the Dec. 15-16 meeting. “The open question is can she convince the market that this is not the start of steady rate [rise] cycle,” he said. The seventh anniversary of the Fed’s first round of quantitative easing was last month. Through several iterations of the massive bond buying program, the central bank’s balance sheet has swelled to $4.5 trillion. The final round of QE ended in October 2014. The Fed last hike rates more than nine years ago. The current near-zero percent rates have been in place since December 2008 in an effort to boost the economy during the Great Recession. Many Fed critics have been arguing for some time that ultra-low rates are no longer need because the crisis is over. “That’s part of the Fed’s playbook,” he said.